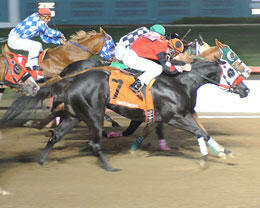 Ride My Wagon (#7) noses out Hh Guns Drawn (#6) and Her Painted Wagon (#5) in the Valley Junction Futurity(G3). ALTOONA, IA�OCTOBER 13, 2012�The 2012 leading sire of money earners Pyc Paint Your Wagon extended his earnings lead Saturday night siring both the winners to the Grade 3 $211,750 Valley Junction Futurity and Grade 3 $89,622 Altoona Derby at Prairie Meadows. It was the 14 and 15 stakes winner for the son of Corona Cartel this season and pushed his career season earnings total well past $3 million dollars. The undercard at Prairie Meadows included the Grade 3 $67,034 Two Rivers Stakes contested over 440 yards. Saturday was the last evening of live racing before the Iowa Bred Championship Night that gets underway on Friday, October 26, with the Bank of America Challenge Championship night on Saturday, October 27. 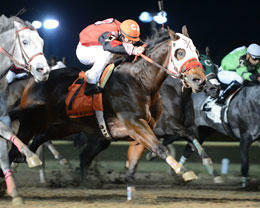 Ride My Wagon stepped up Saturday night to take the $200,000 Valley Junction Futurity(G3). The race capped a double for trainer Stacy Charette-Hill who won the Altoona Derby earlier on the card. The Oklahoma-based trainer saddled four winner on the night. Under jockey David Brown the Pyc Paint Your Wagon filly out of the Shawne Bug mare Shawne Kate completed the 350 yard course driving in :19.674 seconds. The $84,700 winner's purse swelled her bank account to more than $104,000. John Hudson leases the brown filly from Michael Pohl. Henry and Linda Bowlan bred her in Oklahoma. HH Guns Drawn finished second gamely, getting out-nodded at the wire. Brent Clay trains the gelding for owner's Bradley Hale and Wade Helton. Hale bred the sorrel in Oklahoma from the Corona Cartel mare Cosmic Corona. The $33,998 pushed his seasonal earnings mark to more than $71,000. Another Pyc Paint Your Wagon daughter, Her Painted Wagon, missed by head to settle for third. The Circle S Ranch, Inc. homebred earned $21,175. Connie Barnes conditions the brown filly out of the Holland Ease mare Going To The Hague. Ridden by Stormy Smith, Her Painted Wagon more than doubled her career mark to $45,457. Hada Certain Charm, Sooner Country Babe, Cartels Choice, Runaway For Corona, Ja Joanies Fly Boy, First Prize Wagon and Paynted Luv completed the field. Corona Mit Go was a mild surprise winner of the Grade 3 $89,622 Altoona Derby Saturday night over Specials Gold and Eufaula Me. The Pyc Paint Your Wagon picked up $33,980 to almost double her career earnings mark to $65,308. Jockey Cody Jensen splits horses aboard Corona Mit Go to win the Altoona Derby(G3) at Prairie Meadows. Stacy Charette-Hill trains the homebred filly out Missy Mit Go, by Hitmito Dancer, for owner's Christie and Mikel Donahue. Cody Jensen had the riding call and completed the 400 yards in :19.728 seconds, a 96 speed index. She paid $19 to win $8 to place and $4 to show. Also a longshot, Specials Gold finished a head back in the place position for owner/breeder A.C. Taylor. Kasey Willis trains the Oklahoma-bred filly. The $14,441 place check pushes her career earnings to more than $55,000. Agustin Silva was up. Fastest qualifier Eufaula Me rallied for third under jockey Berkley Packer. Brent Clay trains the gelding for John Lawless. Bred in Iowa by Sheri Lynn Andrew, Eufaula Me earned $13,167 for the effort. Favorite Cruzin The Wagon finished fourth after getting bumped at the start. Completing the field were Kool Wagon, Bp Valliant Man, Beda Kickit In, Cash For Wagon, Crowned Silver and Docs Dynasty 123.